This has got to be my very favourite time of year! I absolutely love the music ( especially Handel’s Messiah ), the lights, sometimes even the snow, and certainly I do love setting up all of my Christmas trees and the Dickens houses. 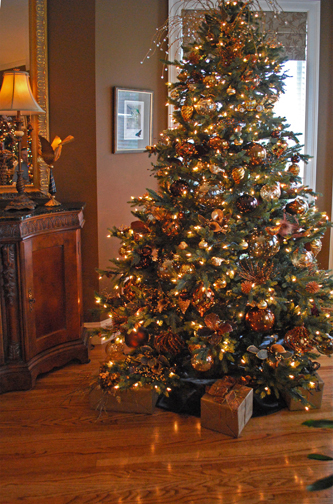 And each year I invite clients and friends and neighbours in to share my enjoyment of the season. 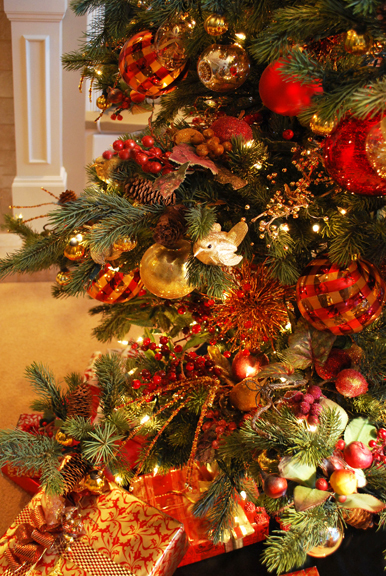 So many of these people have remarked on the way that I decorate my Christmas trees and so I have decided to do a post all about the ‘tricks’ that I have discovered after many years of doing my own trees and those of a few of my clients’. First of all, the design principles are the same as those that I use when designing my own or clients’ gardens. 1. COLOUR: I know, I know… I’ve said it many times, but it is true! ‘Eye goes to colour’, and so my first design consideration is the colour that I am planning to use on a tree. I am definitely a traditionalist, I must say. Because, after all, Christmas only comes around once a year, and so, I never tire of the Traditional Look. This does not mean boring, however, as I like to use colours that enhance the rooms that the trees are going to be in. 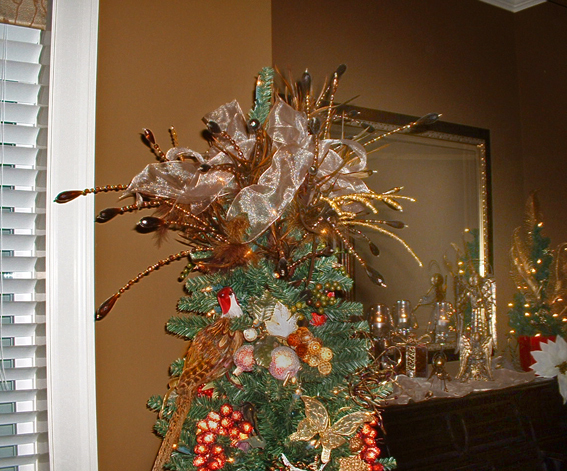 Each of my trees has ornaments that complement the decor of the room that they will be in. 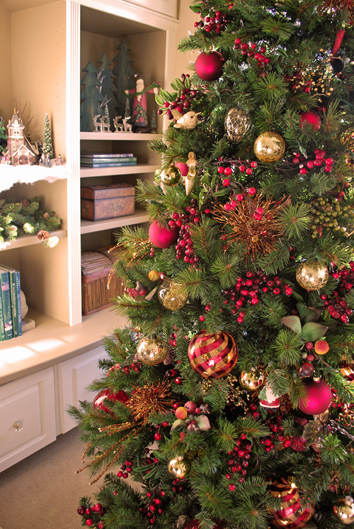 This room has a definite brown tone and so do many of these ornaments. 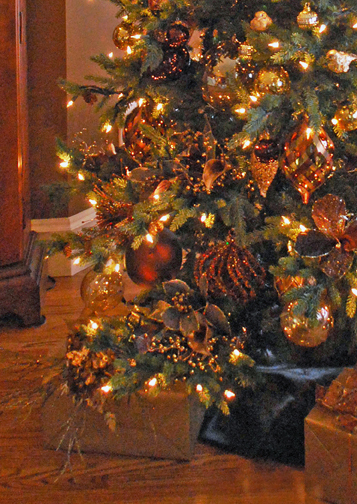 Below, is the Gold and Red tree, in our Family Room. 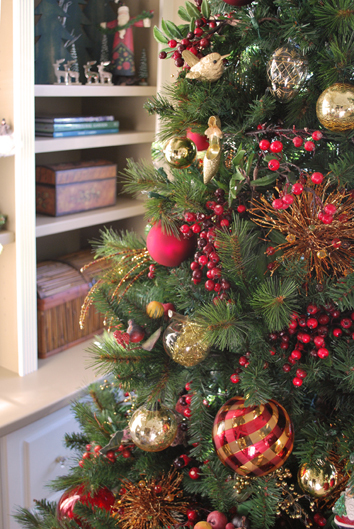 The gold and rich reds of these ornaments, together with the presents under the tree, make a good complement for the other colours in the room. 2. SCALE AND BALANCE: This might seem obvious but believe me, I sure have seen some unbalanced trees around, sometimes even in upscale magazines! 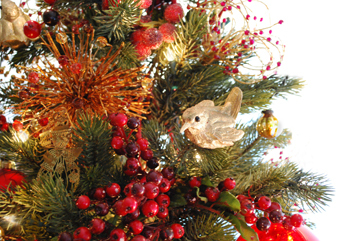 Below, you can see that there are many different sizes and shapes on this tree but there is a balance, as the cluster of berries does balance the larger, plaid, gold and red, round ornament. 3. FOCAL POINT: As in the outdoor gardens, it is always good to have a focal point that will help to set the mood. 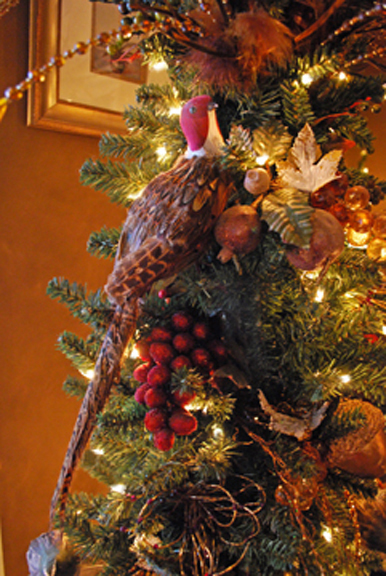 On this tree, below, there are many different birds and berries but one focal point, this large pheasant. 4.DEPTH: One of the design principles that is quite important to remember here, is that depth is achieved by placing both small and larger items deeper into the centre of the tree. It is quite easy to do this using berry bunches, below. 5. TEXTURE: It is often the texture of a plant that makes it interesting, in our gardens. 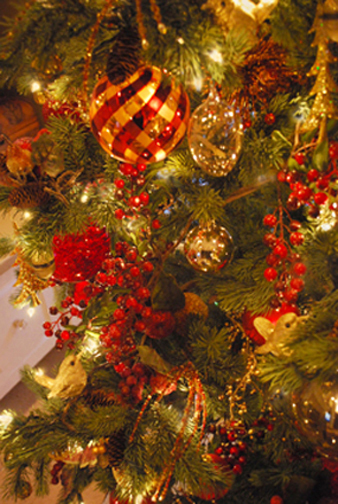 Using many different shapes and textures, as seen, below, has the same effect for your Christmas tree decorations. 1. Never leave the original string on the ornaments. I exchange it for a thin, green plastic wire. 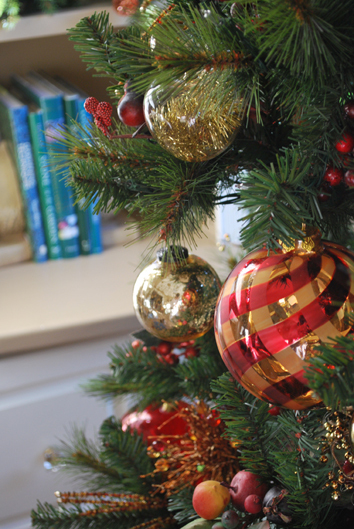 Make sure you make it long enough, as you may need some length when you try to place it on a different branch next year! Note how this wire blends in so well. 2. 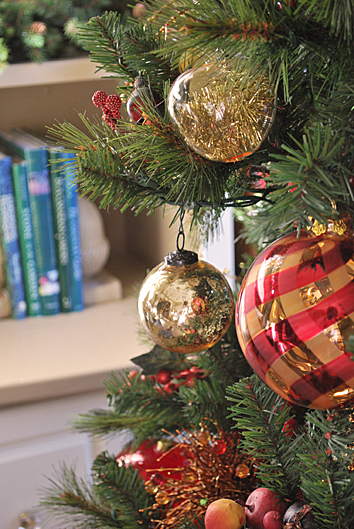 When working with artificial trees, I always try to hide the green wire connecting the ornament to the tree by simply bending down the tip of the branch. See the photos, below. The first one shows it before bending down the end of the small branch and the next one shows it hidden. 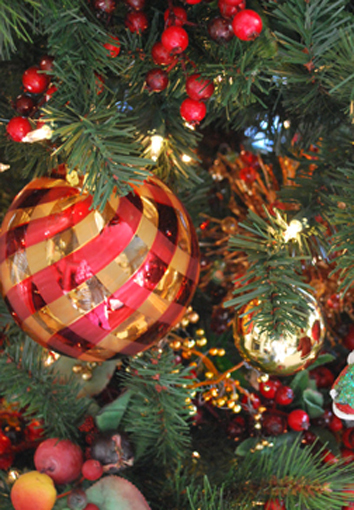 Although this green wire is less obvious than the long strings that are on most ornaments, still it can be hidden even better. See below. This simple trick will hide the wires. 3. 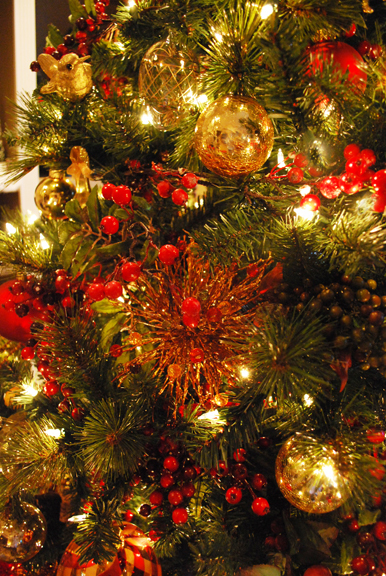 Do not hang large ornaments on the very ends of the branches. This destroys the shape of your tree. 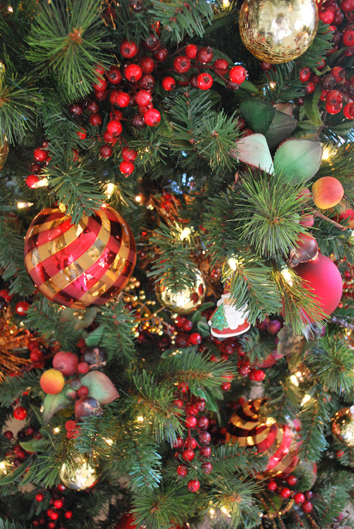 Notice how all of the larger balls are not out on the very ends of the branches. Very small balls can be, but not the larger ones, please. 4. Try to remember that depth, on the tree, and in the garden, will make the presentation much more interesting. 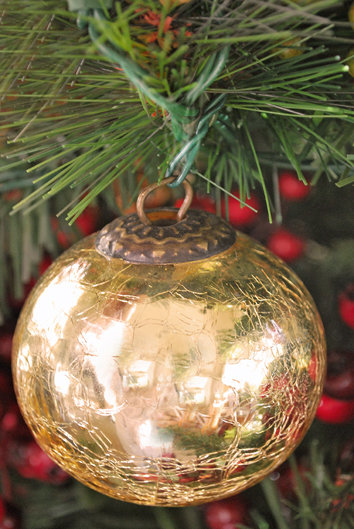 Note how the very small gold balls are placed quite deeply, well into the tree. This depth adds the interest.